Fujifilm has announced the launch of the its newest addition to the X100 premium compact line, the Fujifilm X100F. It features a 24.3MP X-Trans CMOS APS-C sensor, without using an optical low-pass filter, which should make for improved resolving power. This is paired with Fuji’s successful X-Processor Pro processing engine, which has seen service in the well-recieved Fuji X-T2 and X-Pro2 models, for image quality that Fuji says should rival cameras with bigger sensors and bigger pixel counts. ISO sensitivity now ranges up to 12,800 as standard, only previously achievable through extended ISO. Autofocus has been improved considerably, with the number of focusing points jumping from 49 in previous iterations up to 91 in the X100F, with around 40% of the imaging area covered by phase-detection AF points. Contrast-detection AF has also seen a boost, doubling data read speed, promising better low-light performance in particular. The Fuji X100F also sees the return of the Advanced Hybrid Viewfinder, first seen on 2014’s X100T, combining elements of both an optical viewfinder and an electronic viewfinder, whose frame-rate is now boosted up to 60fps. In ‘Electronic Rangefinder’ mode, the EVF view pops up as a small window when using the optical viewfinder for checking focus, all while users are using the quick and crisp optical viewfinder. In fully electronic mode the viewfinder allows previewing of exposure, white balance and other settings. On the outside, the X100F sees the older X100T’s button layout been shifted slightly so that the more commonly-used features are located on the right-hand side, in the hopes that users won’t have to take their eye from the viewfinder to change settings. Perhaps the most important change is the addition of a joystick selector for moving the focus point, as previously seen on the X-Pro2 and X-T2. 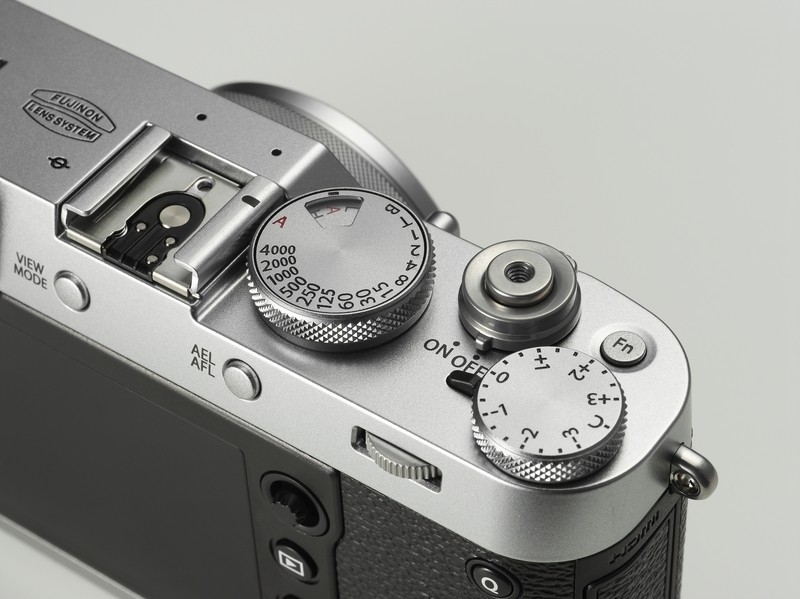 There’s also a retro film camera-inspired built-in ISO dial, incorporated into the shutter speed dial. 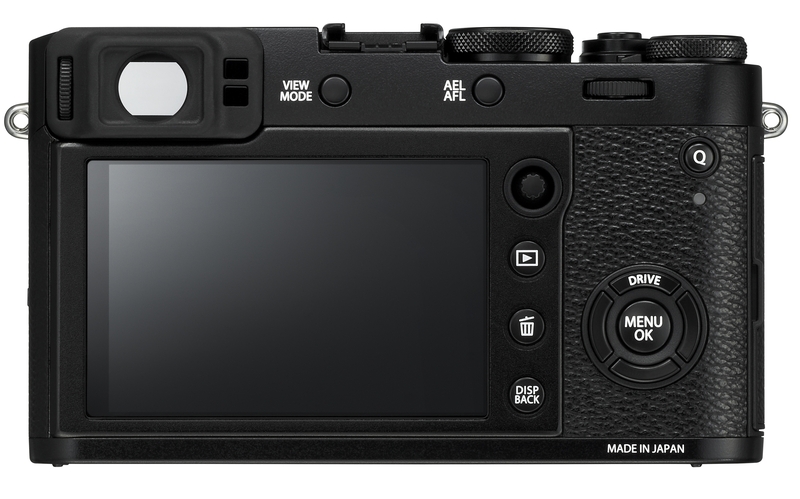 Addressing some users’ concerns about this control’s practicality on the X-Pro2, users can elect to change the ISO setting using an electronic control dial when the ISO dial is in its ‘A’ position. The camera’s front is graced with a Fujinon 23mm f/2 lens which appears to be the same and on previous X100 generations, which gives an approximately 35mm equivalent field of view. Other features include, perhaps unsurprisingly, Wi-Fi connectivity, Full HD video recording, and Fujifilm’s Film Simulation modes, for creative shooting. The Fuji X100F will be available from February 16th 2017 in black and silver, with an RRP of £1,249. Also announced today are the Fujifilm X-T20 and the medium format Fujifilm GFX 50S. FUJIFILM Corporation (President: Kenji Sukeno) today announces the launch of the latest premium compact digital camera – the FUJIFILM X100F in February 2017. Fujifilm pioneered a new market segment of premium compact digital cameras in March 2011 with the launch of the FUJIFILM X100, equipped with an APS-C image sensor, high-speed image processing engine, high-performance FUJINON lens and the world’s first Hybrid Viewfinder that can be switched between an optical viewfinder and an electronic viewfinder. In February 2013, the second-generation model in the series, FUJIFILM X100S, was released with a newly-developed sensor and image processing engine. The company updated the series in September 2014 with the launch of the FUJIFILM X100T, boasting the use of the world’s first electronic rangefinder function, in an effort to constantly lead the segment of premium compact digital cameras with cutting-edge technologies. three-dimensional feel and even the atmosphere surrounding it. You can now change the magnification of the electronic rangefinder, shown in a small window as EVF at the bottom right corner of the optical viewfinder, for enhanced accuracy when checking the focus. The Real Time Parallax※2 Correction function is applied to the focus area in addition to the guide frame to enable assured framing and focusing in the Manual Focus mode. New features in the X100F include the Built-In ISO Dial, incorporated into the Shutter Speed Dial reminiscent of film cameras of yesteryear, the Focus Lever, which allows you to instantaneously move the focus area without having to take your eye off the viewfinder, and the “C” position for enabling ±5 stop exposure compensation. Most of the operation-related buttons and dials are concentrated on the right-hand side to allow quick change of settings while firmly holding the camera. seconds, ensure the camera operates exactly as the photographer intends. focusing points has been dramatically expanded from 49 in previous models to 91 (up to 325 points). pixels to form a fast and precise phase detection AF area that can be used in a variety of scenes. ※2 The gap between the shooting range frame and actual shooting range when shooting close up. photographic film production to achieve ultimate image quality. sensor with higher pixel count. remember seeing in real life. ・ The Film Simulation function now features the ACROS mode. Using X-Processor Pro’s advanced processing capability, the mode offers smooth gradation, deep blacks and beautiful textures to create monochrome images that far outperform the previous Monochrome mode. the image is printed out. ・ Despite having the pixel count 1.5 times that of the X100T, the new device and its enhanced signal processing technology have successfully controlled digital noise even further. Improved ISO sensitivity means ISO12800, which was part of extended ISOs in the X100T, is now available as a regular ISO option. Even at ultra-high ISO settings, the camera produces low-noise images, reproducing deep blacks and smooth gradation of tones, capturing beautiful images even in low light conditions. Basic response specifications have been enhanced to the extreme in the X100F. A startup time of approx. camera operates exactly as the photographer intends. The number of focusing points has been dramatically expanded from 49 in previous models※3 to 91 (up to 325 points). Approx. 40% of the imaging area (center area containing 49 focusing points) is covered with phase detection AF pixels to form a fast and precise phase detection AF area that can be used in a variety of scenes. The X100F has an enhanced ability to autofocus on points of light, low-contrast objects and subjects with fine and delicate textures such as bird feathers and animal fur, which have been the weakness of phase detection AF. The X100F offers AF-S for stationary subjects and AF-C for moving subjects. For both of these options, you can choose either “Single Point” or “Zone” mode for the type of focus area, as well as the “Wide / Tracking” mode, in which the camera automatically selects multiple areas for focusing. In the Single Point and Zone modes, use the Focus Lever beside the LCD monitor to instantaneously change the location and size of focus areas. ・ The X100F uses the Advanced Hybrid Viewfinder, which combines the features of an optical viewfinder (OVF) and electronic viewfinder (EVF). Operate the Viewfinder selector at the front of the camera body to instantly switch between the OVF and EVF. ・ In the Electronic Rangefinder (ERF) mode, the EVF is displayed as a small window at the bottom right corner of the optical viewfinder to facilitate accurate focusing using Focus Peaking and Digital Split Image even in the OVF. The small EVF window can display 100% field of view as well as in 2.5x and 6x magnifications. You can also check exposure and white balance in the EVF window, making it the ultimate viewfinder that provides all the benefits of the EVF while shooting photos through the OVF, which offers zero time lag and crisp view. ・ The viewfinder offers automatic real-time correction of parallax, the gap between the guide frame and actual shooting range when shooting close up. This Real Time Parallax Correction function is now applied to the focus area in addition to the guide frame to enable assured framing and focusing in the Manual Focus mode. ・ The EVF’s frame rate has been boosted to 60 fps. Even in low light, the high frame rate is maintained for easy framing in night shooting, etc. ・ The layout of the camera’s rear face has been overhauled to concentrate most of the frequently-used buttons and dials to the right-hand side. This allows you to change the camera settings quickly while holding the camera firmly without having to take your eye off the viewfinder. 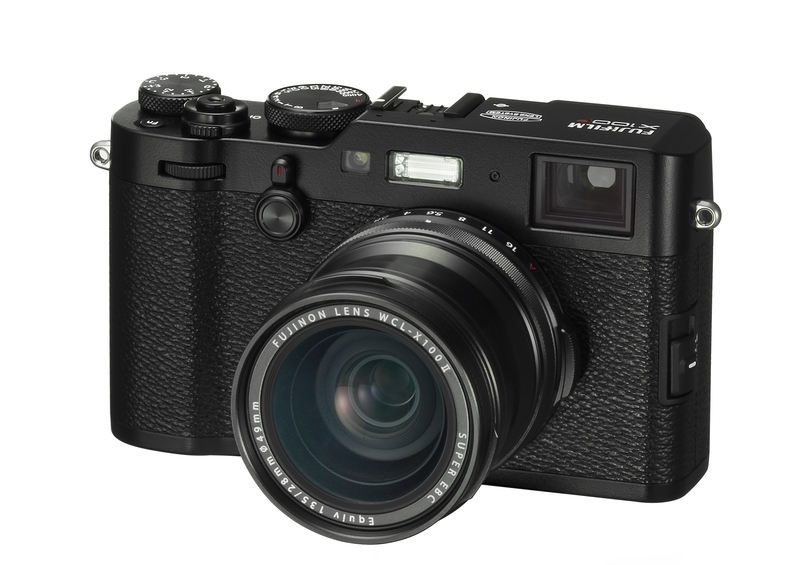 ・ The X100F features the Built-In ISO Dial, which is incorporated into the Shutter Speed Dial, reminiscent of film cameras from yesteryear. You now don’t have to power on the camera to check ISO as well as aperture, shutter speed and exposure compensation settings at a glance. ・ Set the ISO Dial to “A” and select “Command” in the ISO DIAL SETTING (A) in the camera menu, to enable quick ISO adjustments with the Command Dial at the front of the camera body within the range of regular sensitivity levels from ISO200 to ISO12800 in the increment of 1/3 stops. directions (up / down, right / left and diagonally) to instantaneously move the focus area. ・ The Exposure Compensation Dial now has the Command Dial Position. Set the Dial to “C” position to enable exposure compensation adjustments with the Command Dial at the front of the camera body, and also expand the exposure compensation range to ±5 stops. alloy. Special coatings have been applied to the surface to create a steel-like texture. ・ The camera’s external surface has a leather-like finish using synthetic leather for excellent resistance to the elements and high durability. While reproducing the feel and look of genuine leather, the finish also provides the practical benefit of slip resistance and comfortable hold. ・ You can choose from six frame rate settings, i.e. 59.94p / 50p / 29.97p / 25p / 24p / 23.98p. ・ A specially designed FUJINON 23mm (approximately 35mm, equiv. 35mm format) F2 lens has an optimal optical design that delivers high levels of sharpness from the centre to the edges of the frame. ・ The Film Simulation modes, popular for still images, can also be applied to video recording. For example, you can use “Classic Chrome” to add a documentary touch with subdued colorus and rich tonality, or “ACROS” to produce stunning monochrome footage with smooth gradation of tones and deep blacks. Nine different modes are available for versatile photographic expressions. ・ The Intelligent Hybrid AF, which switches between Phase Detection AF and Contrast AF according to the scene, also works during video recording to achieve fast and accurate focusing. Manual Focusing is also supported. be changed enabling movies to be shot using an exposure of the user’s preference. device and attach it to images. ・ The app’s “Remote Control” function enables wireless operation of the X100F’s shutter, exposure, etc. from your smartphone or tablet device. The Remote Control function allows you to not only handle basic operations such as Touch AF and Shutter Speed selection, but also adjust a diverse range of shooting settings or even record video remotely. It makes it easy to compose and take a photo from a remote location when shooting a group photo, self portrait or even wildlife in their natural habitat. ・ UsetheDigitalTeleconverterfunctiontochoosetheanglesofviewequivalentto50mmand70mm,in addition to the built-in lens’s 35mm, which allows you to enjoy framing versatility with three different focal lengths. The lens barrel features the Control Ring in addition to the Aperture Ring. Settings that are frequently used in each of the shooting modes are automatically assigned to the Control Ring. Rotate the Control Ring to quickly change various settings. Functions to be assigned to the Ring may be adjusted by pressing the built-in Control Ring Settings button into Viewfinder selector at the front of the camera body. Assign any function without any restrictions, such as ISO sensitivity and Film Simulation. The X100F’s lens has a built-in ND filter, which is useful when shooting with the aperture wide open in bright light, or when opting to use a slow shutter speed. The three-stop ND filter, which cuts down the amount of light to 1/8, can be activated easily with the function button or from the camera menu. Advanced Filter functions offer creative fun. Pop Color / Toy Camera / Miniture / Dynamic Tone / Partial Color (red, orange, yellow, green, blue, and purple) / and Soft Focus can be chosen, as well as advanced shooting techniques such as High Key and Low Key. The X100F supports multiple exposure, in which you can take two exposures in single frame. It can display the first shot on the LCD monitor, so that you can check how it would blend together while composing and shooting the second frame. This function creates an artistic effect, different from regular single-exposure shots. ・ Interval timer shooting for time lapse photography is available with intervals of one second to 24 hours and up to ∞(infinity) frames. ・ New conversion lenses are optically designed to draw out the maximum performance of X100F’s built-in lens, delivering premium picture quality without having to change the F stop value. The camera body automatically recognizes it when a conversion lens is mounted, and displays a guide frame indicating the shooting area when in the OVF mode. perfect for when you want to capture a broader view such as when shooting in tight spots or landscapes. from as close as 14cm. Leather Case that emphasizes a sense of unity with the body as well as practicality. 4sec. to 1/4000sec. [P mode]、30 sec. to1/4000 sec. [All modes] Bulb mode[up to 60min.]、TIME:30sec. to 1/4000sec. Bulb mode:1sec. fixed、TIME:30sec. to 1/32000sec. 4sec. to 1/32000sec. [P mode]、30sec. to1/32000sec. [All modes] Bulb mode[up to 60 min.]、TIME:30sec. to 1/32000sec. Full HD 1920 x 1080 59.94p / 50p / 29.97p / 25p / 24p/23.98P, 36Mbps Continuous recording : up to approx. 14 min. HD 1280 x 720 59.94p / 50p / 29.97p / 25p / 24p/23.98P, 18Mbps Continuous recording : up to approx. 27 min.